David Ollila, a serial entrepreneur who has started seven companies, took on a tough personal challenge in launching one new business in 2009. 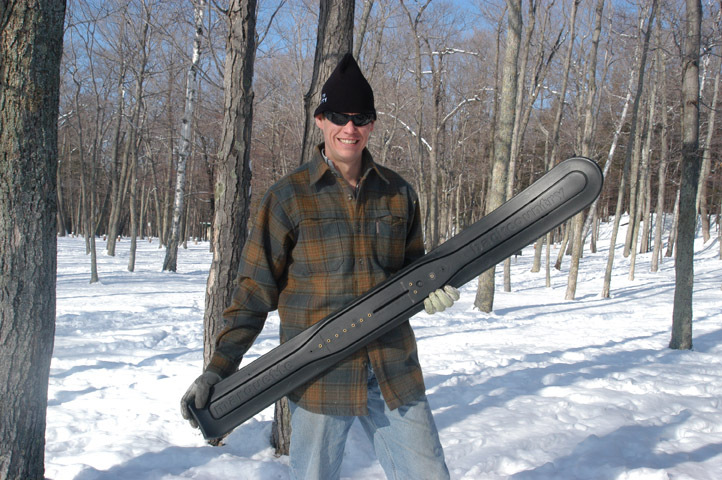 Ollila, 42 and of Marquette, came up with an idea for a ski-snowboard hybrid that he hoped could be built profitably in Michigan -- not in China, which he’d relied on for manufacturing in the past. His plan, hatched in November 2009, was to spend less than $100,000 in start-up costs, develop and build his ski in Michigan and be in operation within a year. Eleven months and $90,000 later, Marquette Backcountry Ski was in business. A month after that, the company was generating positive cash flow, he said. His accomplishment also won him an invitation to the White House in early January, where Ollila participated with about 30 other business executives in President Barack Obama’s “Insourcing American Jobs” summit. Ollila said he thinks there is a big opportunity for companies, especially smaller ones, to manufacture their products locally, as costs rise in China and other developing nations. His company contracted with Twisthink, a Holland design firm, for initial design work. Camoplast Inc., an auto supplier in Coldwater that had some underutilized production capacity, manufactures the skis. To see a video on Ollila's hybrid, click here. Ollila acknowledged it can make sense to manufacture in China, particularly for such high-volume goods as televisions and clothing. China remains a manufacturing dynamo and isn’t likely to give up that title easily as it seeks to expand its economic power. The United States imported $366.4 billion worth of goods from China in the first 11 months of 2011, up from $296.3 billion for all of 2009, according to the Census Bureau. And China enjoyed a trade surplus of $272.3 billion with the United States at the end of November. But Ollila and others say manufacturing products in China and exporting them to the United States isn’t always the best strategy. Low labor costs in China can be nearly offset by other costs and problems with manufacturing there, Ollila said. Data on labor costs in China are sketchy, experts say, because the country does not adhere to international standards in reporting those figures. Labor rates also vary widely in the country. Workers in urban areas of China, where most of the largest manufacturers are located, earn far more than what workers in rural parts of the country make. In a special study for the federal Bureau of Labor Statistics last month, researchers estimated that urban manufacturing workers in China earned $2.38 an hour, including benefits, in 2008, the latest year for which data was available. Workers in China’s rural towns and villages earned just 82 cents an hour in 2008. That compared to total compensation of $32.78 an hour for U.S. manufacturing workers in the same year. But the Bureau of Labor Statistics study also found that compensation costs are rising rapidly in China, having jumped 139 percent for rural and urban workers between 2002 and 2008. Growing labor shortages are pushing labor rates up at a rate of nearly 20 percent a year, according to a study released last March by the Boston Consulting Group. The study predicted a “manufacturing renaissance” in the United States within the next five years. In addition to escalating labor costs, the value of China’s yuan currency also is rising against the dollar, making Chinese-manufactured goods more expensive here. Shipping costs also are a concern, although they’ve fallen recently as a result of slackening global demand for goods and more new ships plying the oceans. In our countries race to the bottom it's easy to kick the unions and decry American labor as the culprit. The bottom line is that we cannot compete with .82 cents per hour or, even $2.38 per hour that is paid to Chinese workers. I own a store in Michigan and we are working hard to purchase items made in America. Unfortunately, my business will probably not survive as customers expect to pay what we paid for things and still stay in business. We had to discount our merchandise by 40% just to intice people to buy and get rid of inventory. You can't pay your bills on a 10% profit margin and, needless to say, we closed the year with a loss. Many other stores closed around us and it won't be much longer before we sucumb as well. We even had customers ask if they could have our stuff for free because it was sitting on the floor while cleaning shelves and were indignant when they were told they were not free. In our race to the bottom we are just now realizing that, if you don't pay someone a decent wage you leave them with nothing but money for the essentials. Watch your small mom and pop stores steadily close their doors until your tourists come to walk around Wal-Mart. And we defend the disparity between the haves and have nots because we delude ourselves in to believe that, if we work harder, then we will be wealthy ourselves. Nope; just poorer and the grasp for the American dream is getting farther away. Propose to: Stop China from shipping finished countertops into Michigan. There so far have been 18 large projects and counting this year in Michigan such as Hotels and condo projects that have specified into the architectural drawings for Granite or quartz countertops in all or most of the occupants. Some projects have as much as 200 units. What happens is you have these projects, they go to bid, all your major manufacturers submit their bid. At this point a company that was not low bid is asked to tighten up their number as a preferred vendor. The Vendor then sends the drawings to a fabricator in China who submits their bid at or below the material cost because the Chinese government has subsidized the project. Competition is good but the tactics used make for an unfair playing field. What would this do to countertop manufacturers in Michigan? The big boys with digital equipment and large facilities that grew during the housing boom that are now suffering would get slammed. They would have more work than they could handle which would force them to focus on this market segment rather than “Mrs. Jones house” (remodel residential kitchens). In turn the small fabricators would focus their efforts on “Mrs. Jones” and grow forcing them to need more employees, and pay their employees more. All parties besides the Chinese would benefit and I’m not even really sure the Chinese are. I will be making a petition from fabricators that would be affected in a positive way by this proposal and have them estimate the # of employees they would need to hire to keep up with demand.